Cork Institute of Technology as a public body in Ireland has to improve its total energy efficiency by 33% by the year 2020. 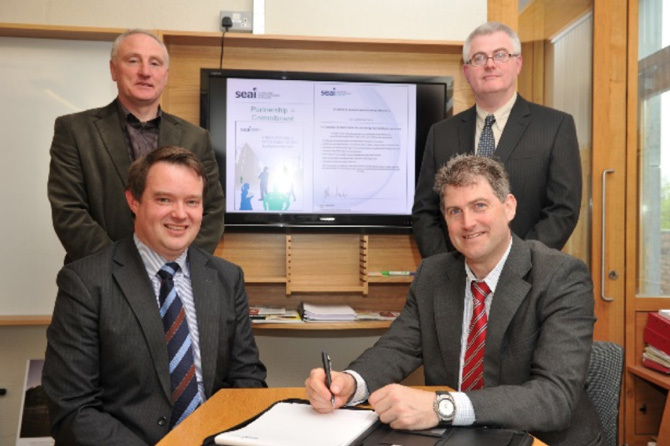 With the objective of improving its energy efficiency by 33% by 2020, Cork Institute of Technology (CIT) has entered a partnership agreement with the Sustainable Energy Association of Ireland (SEAI) Engaging People Programmeand the Office of Public Works (OPW) Optimising Power @ Work Public SectorProgramme. 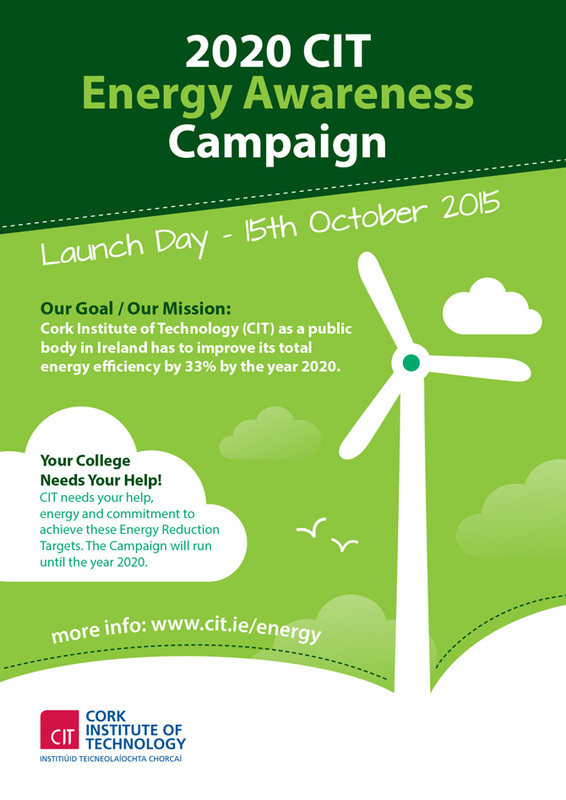 CIT’s Energy Team will launch their latest energy initiative on October 15thnext in the form of an Energy Awareness Campaign across all CIT’s campuses: Bishopstown, CIT Cork School of Music, CIT Crawford College of Art and Design, the National Maritime College of Ireland and Blackrock Castle Observatory. The journey in to a more efficient energy and conscious environment started in 2011 with the introduction of an Energy Sub-metering system and CIT’s Energy Team was formed in 2012 to promote energy initiatives and support all energy related projects. 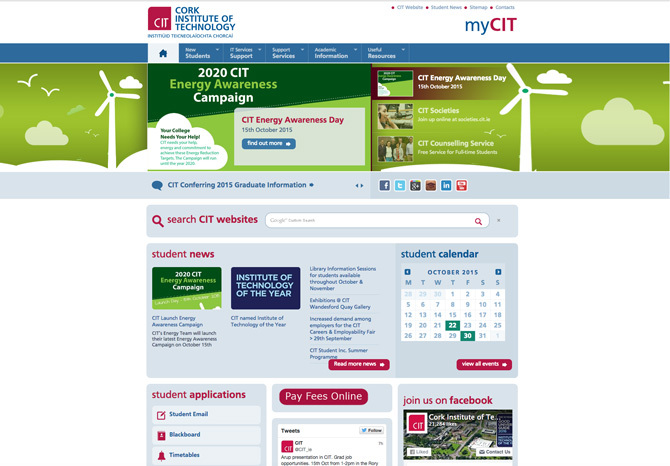 CIT’s energy spend of €1.5 million at the start of the initiative, has been reduced by €125,000 per annum due to energy improvements and projects to date. Each of CIT’s buildings has an energy baseline that it requires to operate and function efficiently. The OPW are assisting in carrying out Energy Audits across the campuses to gain a better understanding of this energy requirement. The main focus, thus far, has been project based with the introduction of three Combined Heat and Power Plants, smart energy efficient pumps and motors, LED replacement lighting projects, lighting sensors, better building services control systems, boiler burner optimising hardware, smart timers on all electrically powered standalone equipment, including vending machines and electrical storage heaters. The Energy Campaign being launched on October 15th aims to engage all students and staff to target and eliminate “people owned” energy wastage and heighten student and staff awareness in simple terms. The goals of this energy initiative is to reduce current energy consumption by 5% in the 1styear and a further 4% over the following two years. The day itself will have many energy themed activities including the following: energy related information stands with experts in the field of energy on hand to enlighten all interested students and staff on all matters relating to Energy Wastage, information energy tours to allow access to energy research test beds across CIT, including NIMBUS research, PRD 2020 retro fit and energy related plant and equipment.